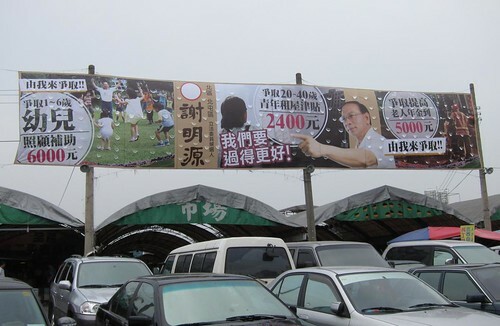 Each month on my blog I post a small collection of election poster photos taken on my sojourns around Taiwan that month. 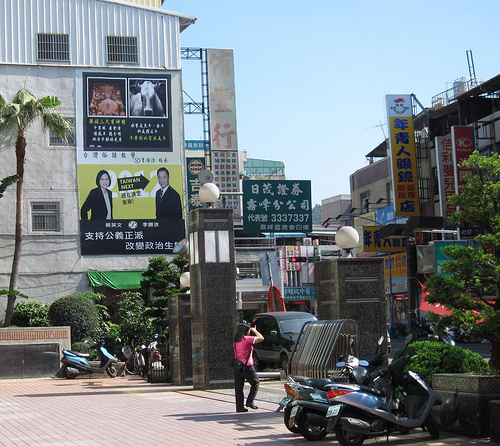 This one is for a colourful candidate taken in the town of Wufeng in southern Taichung county. 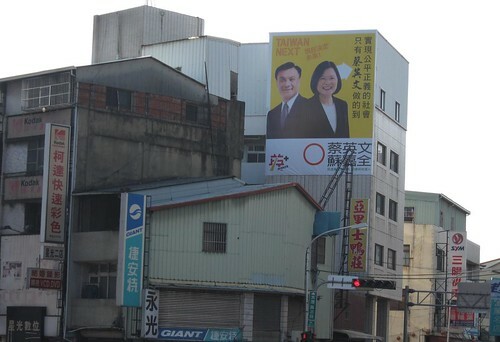 DPP candidate Tsai Ing-wen and her running mate Su Chia-chyuan. The white empty circle is the space where her number is going to go once the candidate’s respective numbers on the election ballot are chosen. 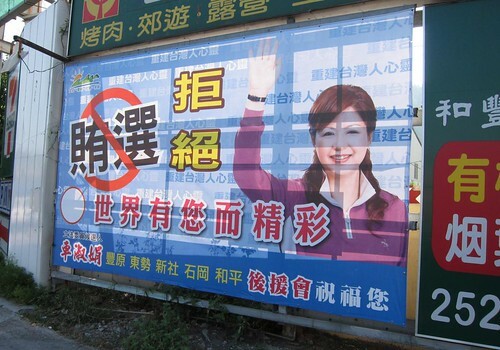 The text next to her says that only Tsai Ing-wen will realize a fair and just society. 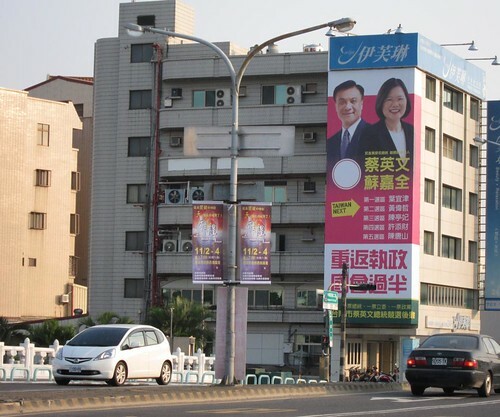 Local DPP candidate posters above a marketplace in Tanzi, a small town in Taichung. Like many candidates, the fellow advertises his educational qualifications, in his case a double PHD. 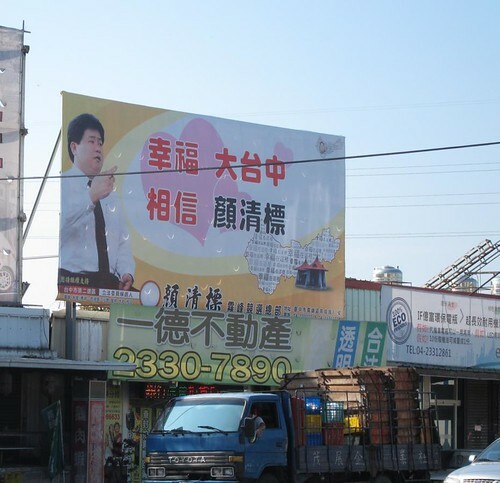 This Taitung candidate says he doesn’t divide people into Blue or Green, but promises to work for Taitung. Taiwan Next! 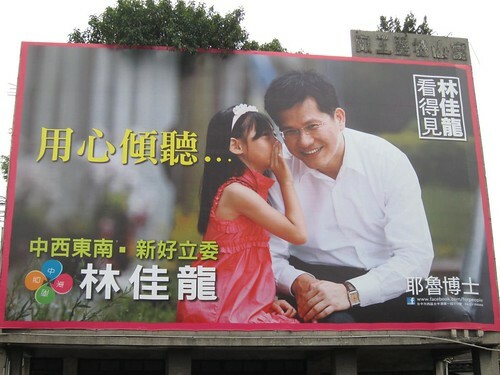 on Tsai-Su poster. 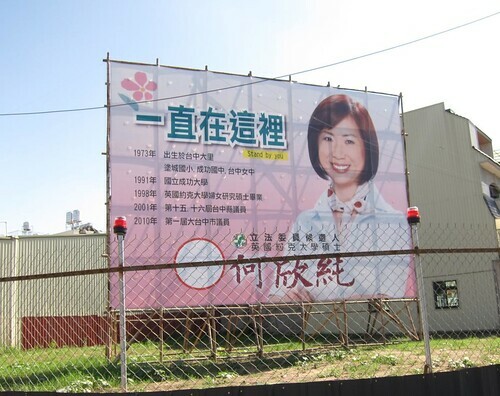 Another DPP candidate lists in her chronology her local birth, her university background, including a masters from abroad and a BA from NCKU, one of Taiwan’s best universities, as well as her service in various elected legislative positions. This candidate, whose sign lacks a party affiliation, says “I get it done” and crows her success at getting a huge sum of money for her district. 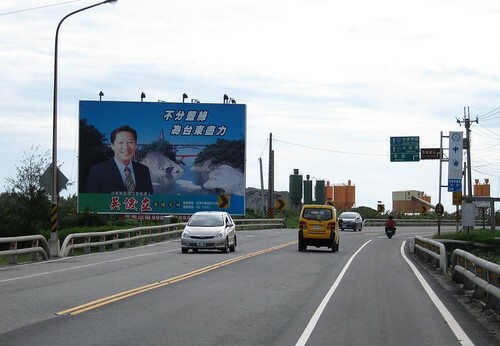 President Ma Ying-jeou of the KMT and his running mate Wu Den-yih share a Taitung sign with a local candidate. 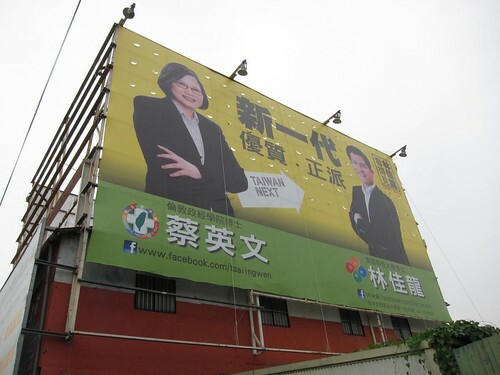 Word I’ve had from several vectors is that local KMT candidates consider having Ma on a sign as a kiss of death, but tolerate him because they need the support from the party center. A KMT candidate’s office peeks from behind some buildings in Fuli town in the east coast rift valley. 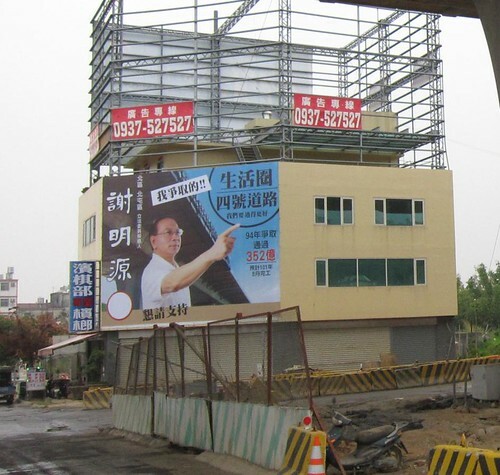 This DPP candidate in eastern Taichung city offers a striking pose as well as taking credit for the new No.4 highway through the area and for bringing in the big bucks for his district. 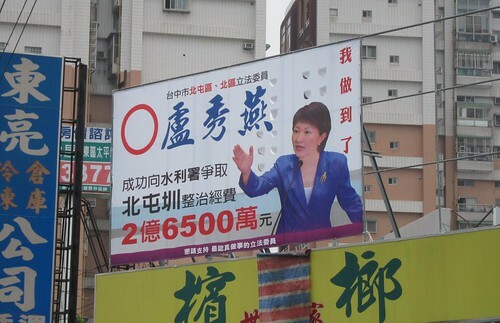 Here the same candidate promises subsidies of varying sums to various citizen cohorts. Unfortunately “pudgy balding bloggers” is not among them. Cars with election gear are uncommon; the thinking is that it invites vandalism. 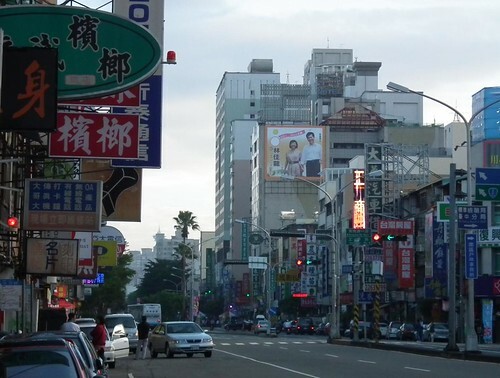 This large, beautiful sign is in Tainan. 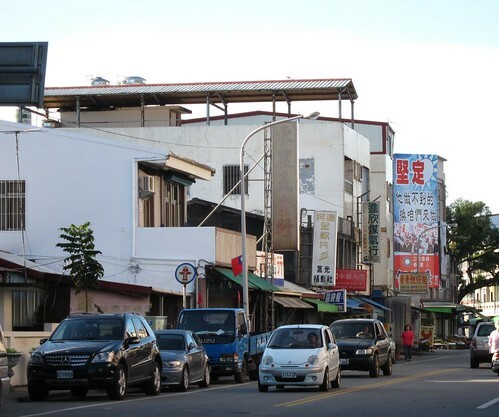 The list below Tsai and Su gives the name and district of all the DPP legislative candidates in Tainan. 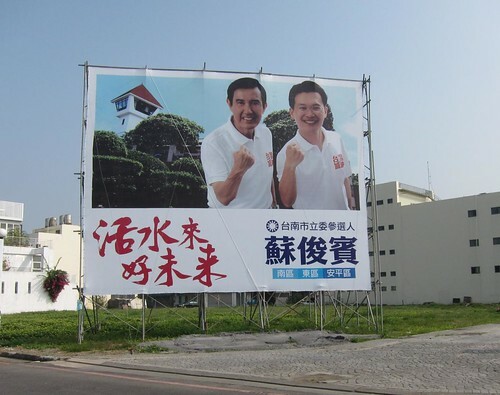 President Ma with a KMT candidate in Tainan. 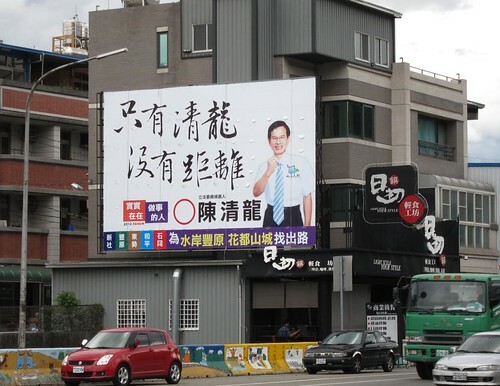 This candidate’s sign says “Rebuilding the spirit of the Taiwanese” and similar sayings on it. The large red characters say something like “the world is resplendent because it has you”. I don’t know whether the saying refers to herself or the voter. 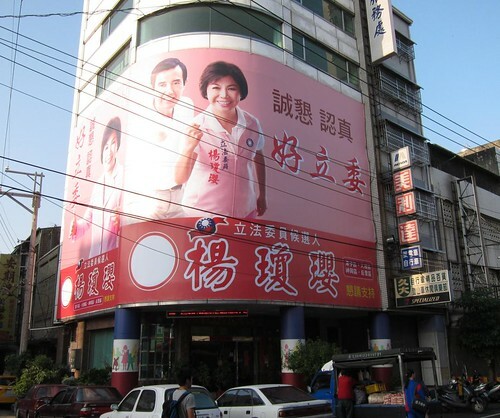 A KMT candidate’s local HQ right in a market in Taichung. 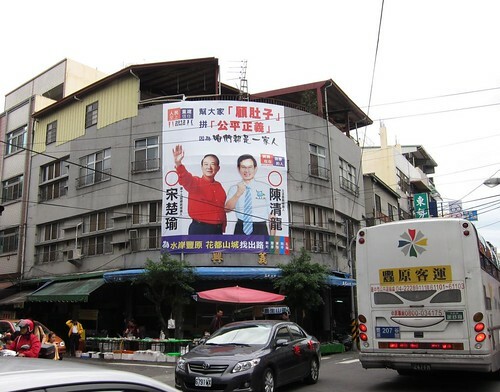 PFP Presidential candidate James Soong (in red), whose candidacy is widely thought to be hurting President Ma’s re-election chances, with a local PFP candidate in Dongshih. The sign calls for fairness and justice in big red letters. Here’s the same candidate again. That tie is probably the reason he is so thin; can’t imagine how he can eat without getting it in his food all the time. 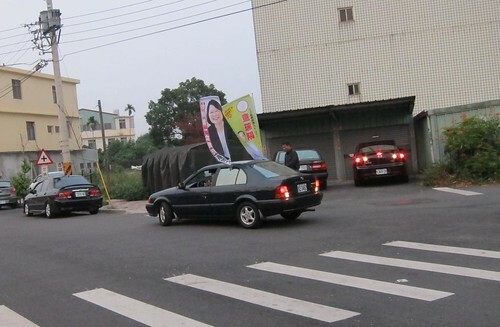 A small political rally in Dongshih strategically positioned at the end of a bike path. 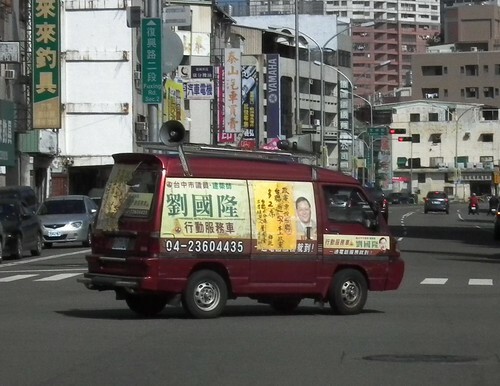 A van advertises a DPP candidate. 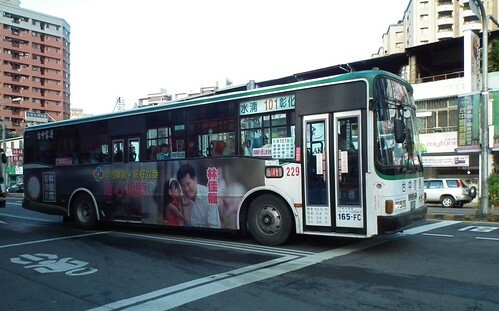 DPP candidate Lin Chia-lung on a bus in downtown Taichung city. 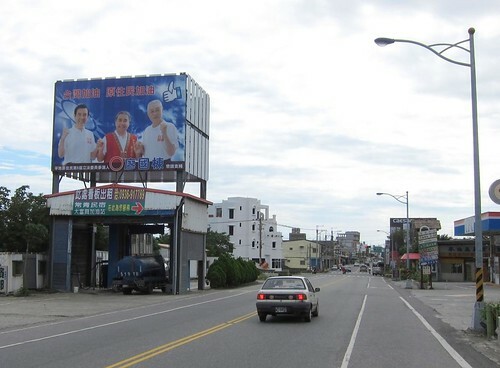 Lin and his wife on another sign. 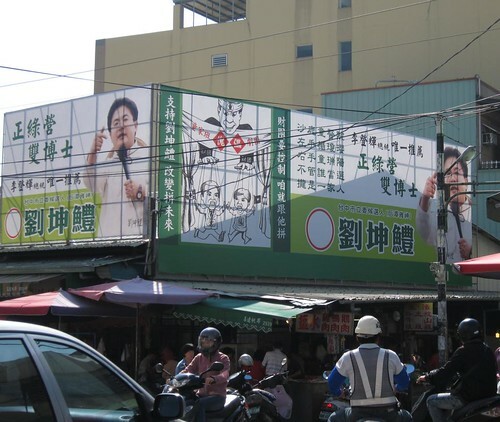 In downtown Taichung, KMT candidates peer around trees at a major intersection. This sign proclaims the Facebook address of the candidates. Social networks may reach people, but do they get them out to vote? Lin again on a sign near the train station in Taichung city. It says he listens with his heart. In the corner it also advertises his Yale PHD. 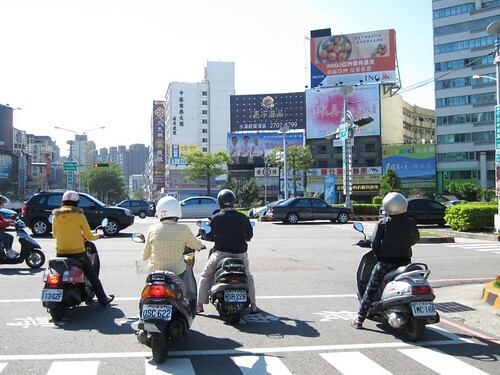 If you don’t know already, Michael Turton is a Taiwan resident, Doctoral student, and owner of the indispensable The View from Taiwan blog. 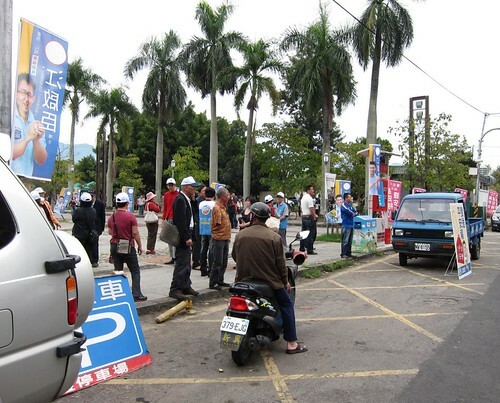 My thanks to him for bringing this visual feast to the Taiwan 2012 blog.